Unit studies are a big hit in our home. The kids enjoy the in depth learning and fun opportunities they provide. We have done them sporadically through the years to add something fun and this year, my son’s curriculum is a unit study, Trail Guide To Learning. The concept of unit studies in general is to integrate as many academic subject areas as possible into the study of a particular topic. This allows students to dig deeper into a subject area and think about it in new and different ways. Unit studies move learning from memorization to understanding. If you are doing a unit study on Christopher Columbus, you might use biographies about Columbus for your reading, grammar and history, map out his journeys and learn about the lands he discovered for geography, sketch sailing ships for art, while studying learning about the stars that Columbus used for navigation. You can see how studying a subject in this way is so much more than learning dates and boring facts. Learning in this way makes kids actually understand and remember what they are studying. Learning science within a unit study is such a natural, fun way to learn science. Since science is everywhere, it is really hard to study a subject fully without incorporating science. I use Christopher Columbus as an example since we are in the middle of studying Columbus in our Trail Guide To Learning curriculum. Back when I studied Columbus, we learned dates and names of ships and countries. That’s about it. I never thought of the science that went into his explorations. Columbus had to know about ocean currents. Since his ships used the wind to sail, he needed to know where to catch winds that were blowing west to get him to the new world and where to catch winds that were blowing east for the return trip. He needed to know about astronomy for navigating. Knowing what animals and plants he would see in different parts of the ocean would tell him where he was, also. Had I learned about all this, I would have been more engaged and interested! How To Incorporate Science Into Your Unit Study? Some unit studies are scripted and the science is automatically included. 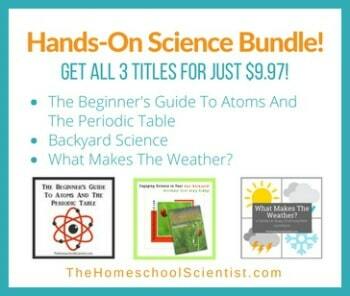 I encourage you to not skip it, even if you are using an additional science curriculum. It’s not all about the science. The subject of your unit study will be more interesting and the student’s understanding will increase with the addition of the science aspect. If you are trying to integrate science into a unit study that has science as an option or doesn’t have a science aspect at all, start with the obvious and work from there. Is there plain science link to the unit study subject? If you are studying a place, you could study animals, plants, weather, climate, or pollution. If you are studying a person, is their occupation science related? You can, always, add experiments that go with your subject. Read, investigate, explore and experiment. Go where your interests lead. The great thing about science within a unit study is that here are no text books telling you where to start or stop learning. It’s academic freedom. Have you ever incorporated science into unit studies? Learn more about how other homeschool moms are teaching various subjects at the How I Teach link up from the iHomeschool Network. This is the second time in this month that I hear about POE – you made me very curious. We do lapbooks, so it’s mini unit studies. So I love the idea of including it all into one unit study. We are loving POE with my 3rd grader. Unit studies are perfect for his learning style. We have always added a few unit studies here and there and really enjoyed them. So, POE has been great. Highly recommended! Mine is a 3rd grader as well. I will definitely look into it more, and maybe switch over – it kind of depends the costs. Thank you. Great post! Funny how it also coincides with Columbus Day holiday (not that we celebrate it). Anyway … I didn’t catch what the acronym POE stands for though ?? As far as celebrating Columbus Day, I’m thinking celebrate isn’t the right word. Maybe “observe” is better.